This product includes an Ebook, ecovers and PSD files. You can use this product to learn ways to increase your own business, and you may resell the product to others. Your customers will have personal use only rights. 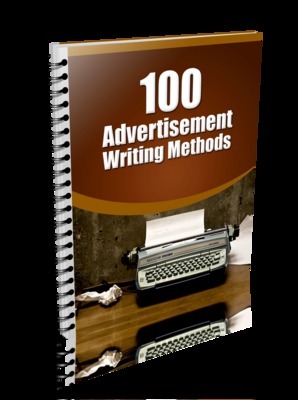 This ebook will give you 100 advertisement writing methods. The two main ingredients you need in any advertisement is a way to grab peoples attention and show them how they can benefit from your product or service. You can do this with attention grabbing headlines and good benefit bullets. This ebook will give you tons of fill-in-the-blank examples you can add to your sales letters, email ads, blog posts, video ads, etc.